Sorry I didn't post on Sunday... Between eating Christmas candy, drinking champagne and baking cookies, health was the last thing on my mind! On the other hand, I have some great family moments! Champagne moments! Christmas morning, after seeing what Santa brought in our stockings and opening about half the presents, we took a break. 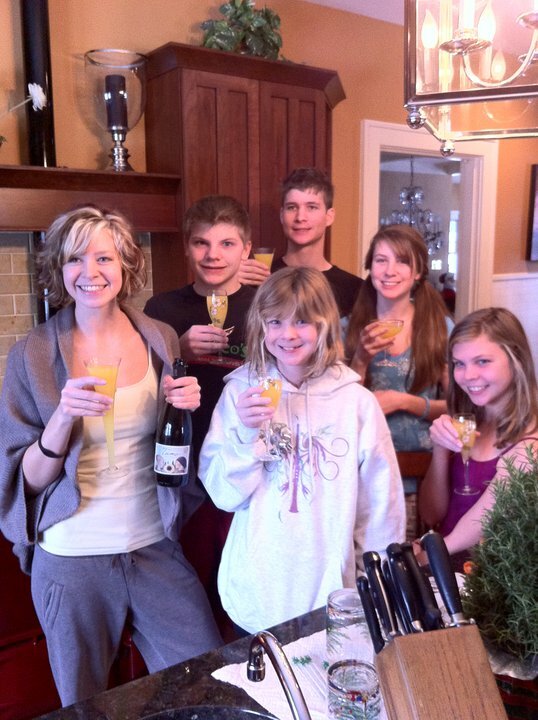 Mom checked the egg casserole, Dad turned on the espresso machine and I started pouring a mimosa for myself... as well as my five younger siblings. I love champagne on the holidays. Always have! Ever since I was little, my parents have let us have a little on Christmas eve, Thanksgiving, Easter and a couple other special holidays. The smaller we were, the less we had, but we all learned how to drink in celebration and socially with our parents rather than learning how to binge with friends behind their back. Anyway, Mom and Dad made lattes and we all enjoyed mimosas! Classy, fun and delicious! The next day I went to visit my boyfriend and his family. After opening gifts, K and I popped open a bottle of champagne. No... Neither of us had eaten much... K started "celebrating"... luckily, I paced myself a little better. "I wrapped them in the carpet." Yes, the champagne hit. And we all pointed and laughed! Nothing that came out of his mouth really made sense after that. So on your New Years Eve, don't worry about being healthy yet... that will come the next day with your New Years resolution! But before you pop open your bottle of champagne for the dropping of the ball (although it will probably be a little more exciting than mimosas with younger siblings) eat your dinner! I must say this is a very good lesson to point out. LOL! The Best Lotion isn't Lotion... It's Oil!